Scrangie: HOLY CRAP!!! NUBAR GO GREEN!!! ALL CAPS!! EXCLAMATION POINTS!! HOLY CRAP!!! 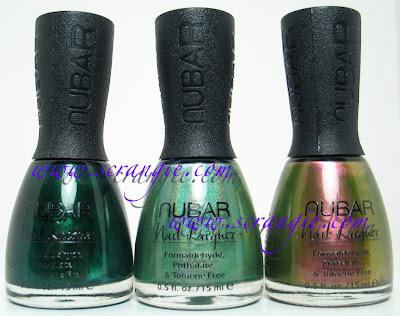 NUBAR GO GREEN!!! ALL CAPS!! EXCLAMATION POINTS!! I'm going to have to tease you with bottle pictures for now, but I am so excited I just can't contain myself!!! OMG I cannot WAIT to see your pics!!! Its a gorgeous collection and about time a company listened to the green lovers!!! Forest and Greener, you must be mine, and that right soon. OOHHHHHH!! A dream come true!! Can't wait to see the swatches! HOLY CRAP!!! !11!111!11 I <3 all of those. Ohhhhhh. I was happy anyway as it is Friday and now I'm even happier! I did a little spin on my office chair. Wooooh hoo! OMG! I can't wait to see these! Please, swatch ASAP! AH! anyway, where can I get them? I live in Indonesia and I can't get them here..
All lacquered up swatched these yesterday if anyone wants to check them out!! Cantcwait to read your thoughts as well! Aieeeeee! I would PUNCH a NUN for Wildfire. The rest of them are awesome also. AHHHHHH!!!! back at you!! I cannot wait to see your swatches, I'm in love with these and may need them all :D I hope the sun comes out!! o.O Woah these are gorgeous! I'm not really into green, but some of these are gorgeous - I think I'm becoming more into colors other than purple and berries. Saw the swatches on the other nail blog. They are BEAUTIFUL!!!! Can't wait to see your swatches in the daylight. I swear, I'm claiming their release date a worldwide holiday. Ooo. I absolutely LOVE Earth. Awesome!!! It is time for some options in GREEN! Check out Zoya Suvi too - very deep and luscious! Wow! They're all fabulous, but I am really loving the duochromey goodness of Wildlife. Wow! That is pretty much all I can say. These are ALL wonderful colors. And Scrangie, your nails a so incredibly beutiful, there is probably no color that I wouldn't think looks great on them! !